If you would like to take weed but don’t like smoking, you can try preparing marijuana tea. The main advantage with weed tea is it’s simple to prepare at home without need for specialized equipment. With just a cup of boiling water, a mug, a tea bag, a sieve,and tablespoon, you might be good to go. The therapeutic experience of taking teas is different to smoking, as the active ingredients pass through the digestive system, resulting in delayed and longer lasting effects compared to smoking. The effects of weed are felt 1 – 1.5 hours after ingestion, and you will feel the effect for 4 – 8 hours. This long-lasting effect is good news for individuals that are taking weed for pain relief. Weed has two major active ingredients, THC,and CBD. THC is psychoactive (makes someone high) while CBD is non-psychoactive (does not make someone high), but has healing properties. If you plan on getting high, you have to make the psychoactive tea that will get you high by adding add oil or some fat to extract THC from the marijuana because it does not dissolve in water. If you don’t you want to get high, there is no need to add any oil or fat. As much as preparing weed tea is relatively easy, you should not confuse it for ordinary tea, and should pay close attention to dosage. Although it may not be that fatal, an overdose of weed tea may land you in serious problems. Take care not to be the guy who walked around naked across the street and slept by the road yesterday! There are many ways one can make marijuana tea, and each one involves many different ingredients and preparation methods. 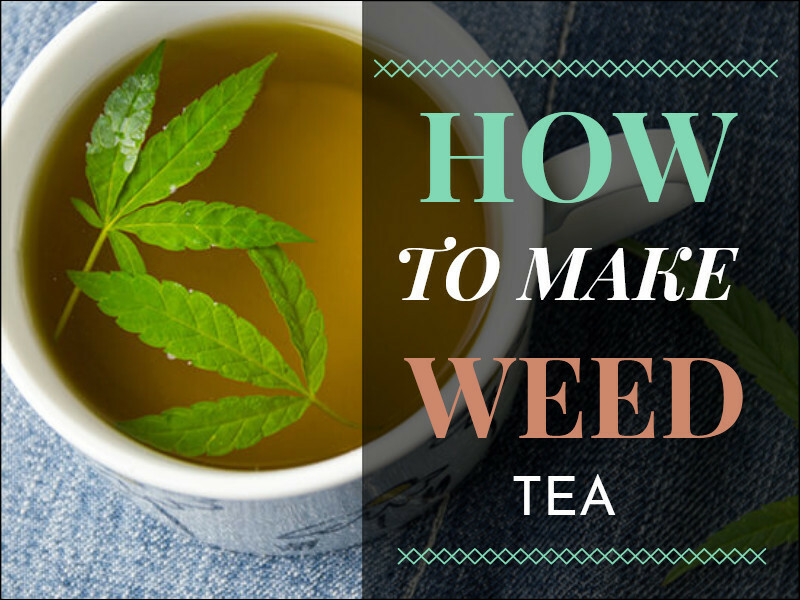 We are going to look at a few preparation methods you can use to make marijuana tea. To make effective medical weed tea requires careful preparation, although, the process is very simple. If you want tea that will get you high, boils cannabis bud in water. As TH is non-soluble in water but binds to oils and facts, you have to add milk, butter, alcohol, or oil to extract it. Note that the most preferred solvent is coconut oil. Put the coconut butter in a bowl. Grind the cannabis and separate out stems. Add buds to the butter while making sure they are fully covered in fat. Add all the contents in the tea bag into the butter-weed mix and mix the contents thoroughly. Put the mixture bag into the bag and reseal. A tea ball will work much better. As well, you can use a tea infuser as it makes things much easier for you. Put the water in a saucepan and heat until simmering boil. Lower the infuser or tea ball into the saucepan with water. Lower the temperature of the heating equipment to the lowest possible so the water does not boil and simmer for half hour. If the water evaporates and appears to be getting low, keep adding little by little during the cook time. Turn off the heating appliance after 30 minutes and allow the content to cool under room temperature so you can drink. If by any chance plant material got out of the infuser or tea bag and mixed with the water, be sure to strain the tea before taking it. If you would like to make Chai, you need to change the ingredients a little. In this case, you will need to remove butter from the ingredients and use a mixture of third water and two-thirds milk. Also, you will need to add 1 teaspoonful of flavoring (preferably vanilla). Put the mixture in a blender and add the ground cannabis. Then place in a saucepan to heat with added water. Take caution so the milk never boils. You have to cook for half-hour. Keep adding water so the saucepan never boils dry. When done with boiling, add sugar or honey, and the vanilla to taste. – Infusing dry weed flowers and water, for a less psychoactive tea as THC cannot dissolve in water. – Heating a mixture of water and tea leafs to which tincture or any other alcohol-based extraction has been added. If you have a very serious condition, we recommend you go for readymade medicinal weed-infused tea from a dispensary as such medication has been carefully prepared by professional to address your needs. Preparing weed tea that can provide a wide variety of recreational, psychoactive, and medicinal effects of weed requires a high level of expertise using hi-tech technology that be used in a home setting.